Tours of the campus are offered Monday - Friday. Guided tours are closed on weekends and on state and federal holidays. Reservations are required. To ensure the quality of the campus tour experience for our visitors, we are only able to accommodate reserved guests. Visitors who do not have an advanced reservation are encouraged to schedule on the next available date or take a self-guided tour. For questions, contact the campus visit line at 808-956-7137 or e-mail visituhm@hawaii.edu. Tour for accepted and applied* students entering in the Fall 2019 semester. Will include an accepted-focused informational session, walking campus tour, and student housing tour. Accepted - Received official acceptance letter in the mail. Applied - Has submitted an application to the Admissions Office and awaiting a decision. Prospective - Has not submitted an application and needs information on admissions requirements and how to apply. Meet with an Admissions Counselor for a 30-minute Admissions Informational Session. A self-guided tour packet will be available after the session to tour the campus at your own pace. 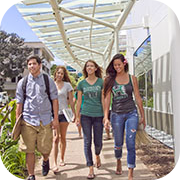 Visit type offered in the summer during interim weeks, study days, finals, and Manoa Move-In. May 3 - May 17 - Study days, finals, and summer interim break. June 27 & 28 - Summer Session 1 study day and finals. August 9 - 23 - Summer Session 2 study day, finals, and Manoa Move-In. If you visit the campus over the weekend, holiday, or during a non-scheduled tour time, we invite you to take a self-guided tour. 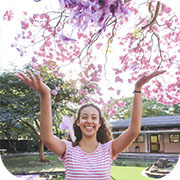 Printed versions of the self-guided tour along with an informational admissions packet can be acquired at the Undergraduate Admissions Office at the Queen Liliʻuokalani Center for Students Services building, room 001. The Admissions Office is open Monday-Friday (excluding state and federal holidays) between 8:00 am - 4:00 pm. Bring your high school* or transfer students on a group tour of the campus! 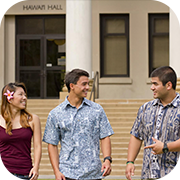 Tour will include a 60-minute walking campus tour led by a current UH Mānoa student. The tour will highlight major buildings, student life areas, labs, small classrooms, and lecture halls. 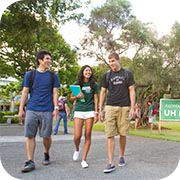 Groups can add-on an Admissions Informational Session (30 minutes) where an Admissions representative will cover information about UH Mānoa including requirements. All group tours will be scheduled in the morning between the hours of 9:00 am - 12:00 pm. Tours must end by 12:00 pm. Group tours need a minimum of 10 students and a maximum of 60 per day. All tours are conducted in English. Groups are welcome to bring their own foreign language translator on the tour, if needed. For middle and elementary school group visits, please contact Adrianne Guerero guerero@hawaii.edu.